Today was a tidying up sort of day. A day for sorting out loose ends. It started off with a visit to the school to pay the deposit for a retiral dinner. Met the lady in question and spent an hour chewing the fat about people we knew in the past and the less savoury ones who were in management in the present. Dropped in at my ex-department, but cautiously didn’t visit ‘my’ room. I prefer to remember it in my mind’s eye. From there I drove in to Glasgow to get the horses cut. It was an old joke when I was at school. The French for ‘hair’ is cheveux and the French for horses is chevaux. When you’re 12 it’s so, so funny to say you’re going to get your ‘Horses’ cut! Not so funny now, unfortunately. Got a Number Four all over with eyebrows trimmed too and all for £7. A bargain at the price with a political diatribe on the failure of a Conservative government to finalise the Brexit details from the bearded one who was cutting hair (or horses) at the next chair, while my Polish barber was bemoaning the dishonesty of fellow barbers who had left with her ‘neck brush’, meaning she had to share the shop ‘hair brush’. I couldn’t say who had the more forceful opinion. With a much reduced head of hair (or horses – Enough? Yes, probably) I went for a walk down the town for a coffee in Nero. 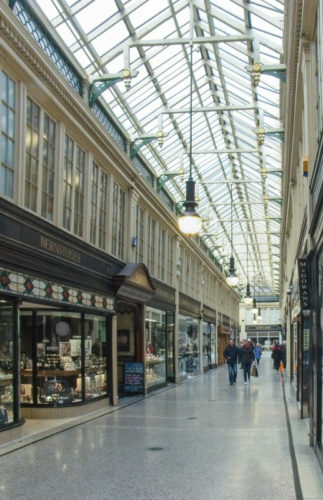 Wandered through the Argyle Arcade and grabbed a few shots to create a PoD and then back up to the car park to retrieve the Juke for a decent enough price of a fiver. Back home I had to get stuck in and clear a living space in the back bedroom for Jackie who was coming to stay the night before going back up to Skye tomorrow. After I found the sofa bed under an assortment of books, tablets, clothes and sketch pads, I started to make some pakora for the starter for tonight’s dinner. It’s such a faff to make, but once the prep is done, you can use it for a couple of days. Visitor arrived and the pakora was deemed good enough for her to want the recipe. I tried to explain that it was a recipe handed down from mother to son or father to daughter, but I know she didn’t believe me after I said I’d send her the link to it from YouTube. Scamp made Chicken & Mushrooms with Rice and then June arrived and a coven was in session, so I cleared up the kitchen, made amoretti coffee coffee for everyone and then settled down with a glass of Grants Sherry Casked to write some emails. Decided I just had enough time to process the PoD and post the blog before the witching hour. Hopefully I’ll make it. Tomorrow we may go to lunch somewhere because Saturday looks snowy!